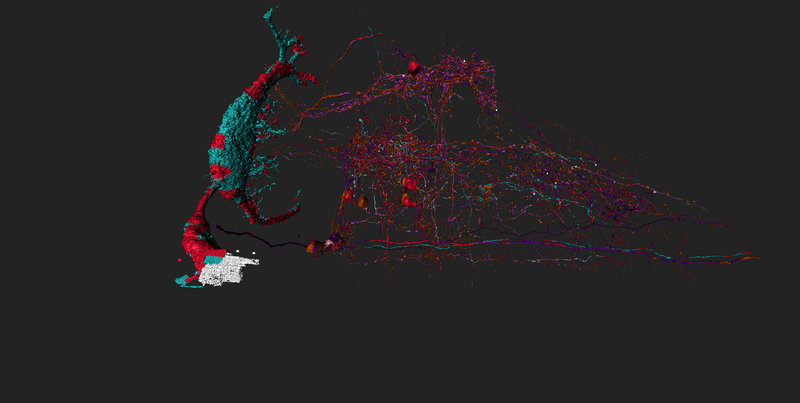 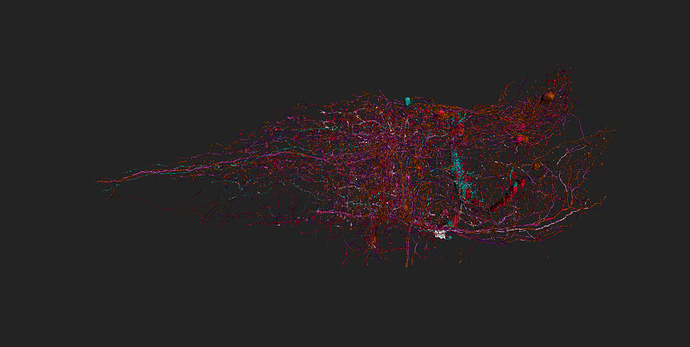 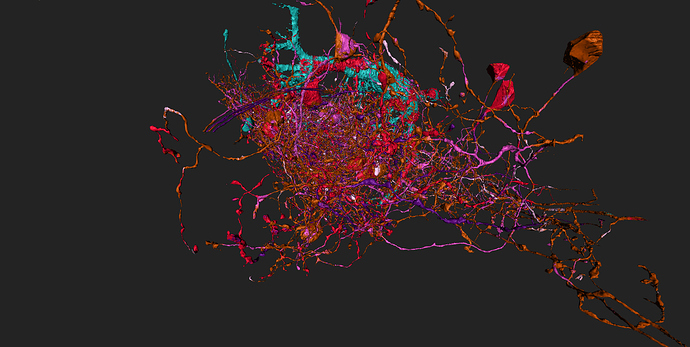 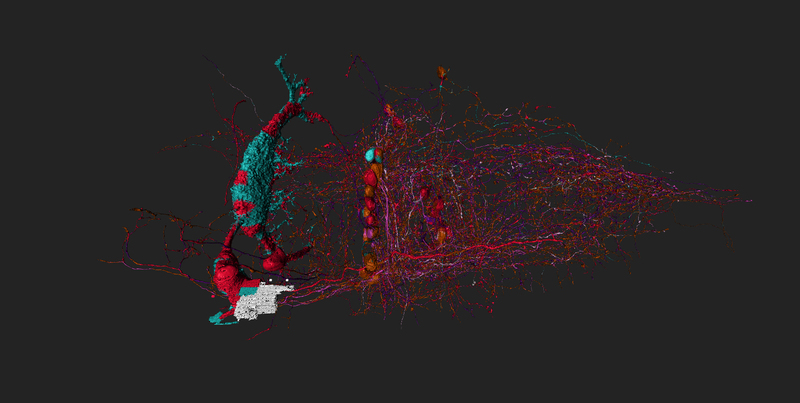 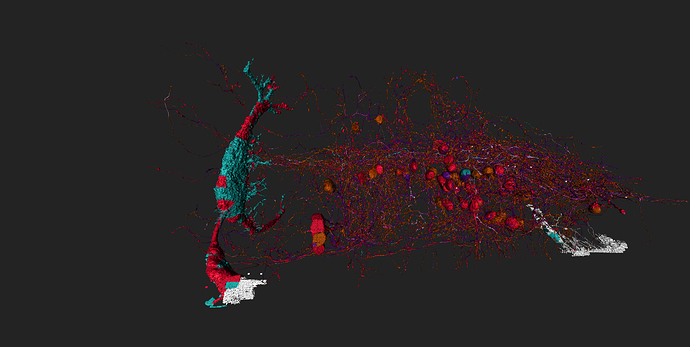 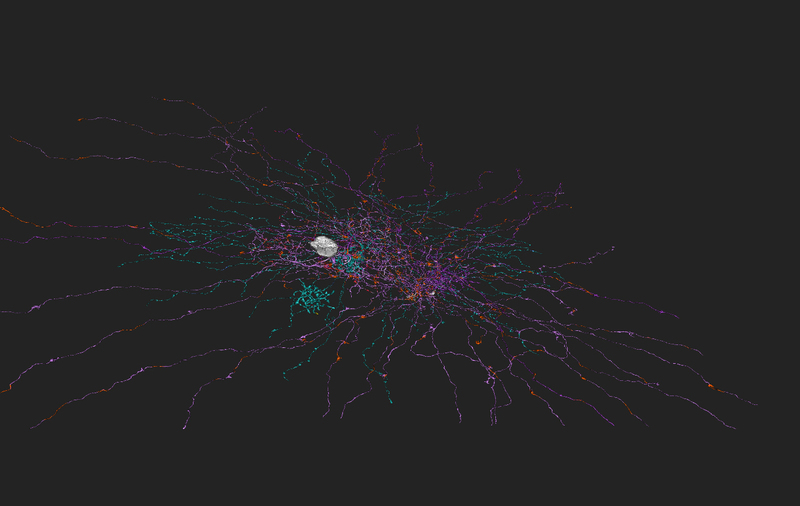 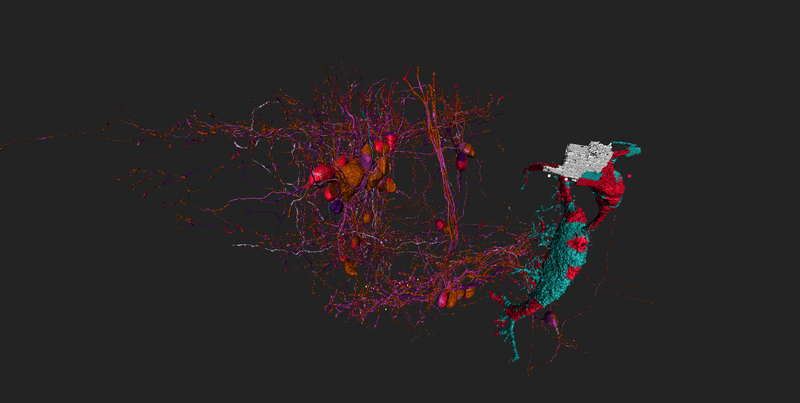 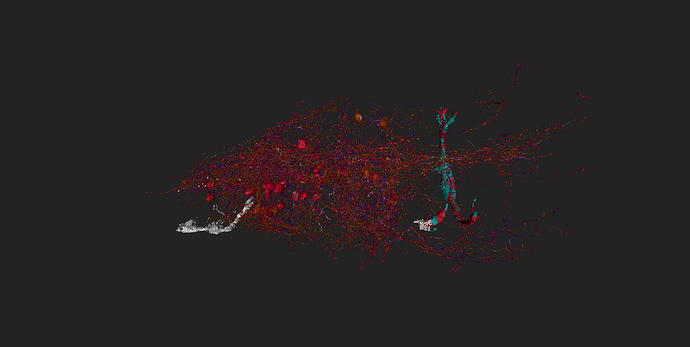 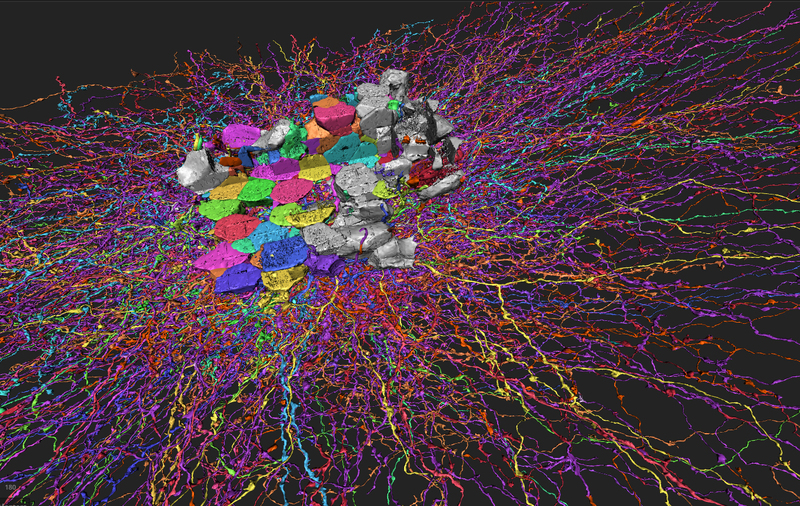 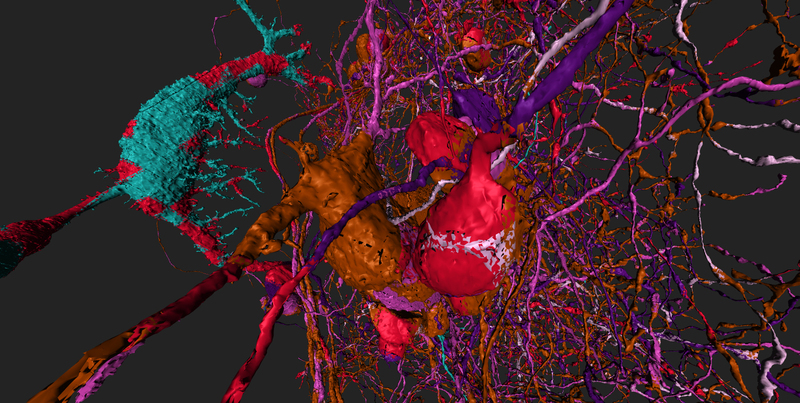 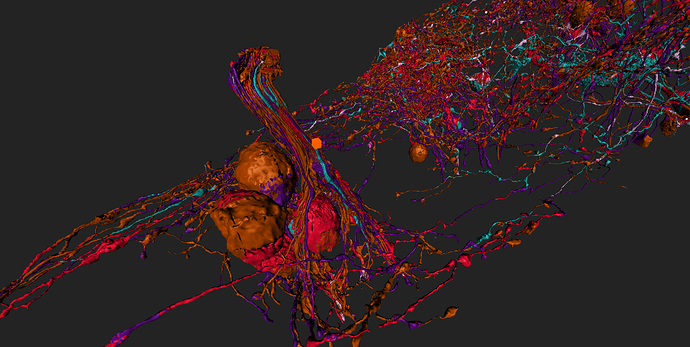 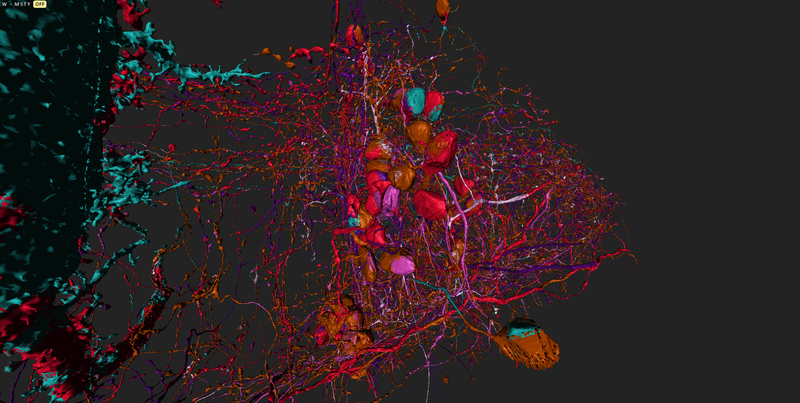 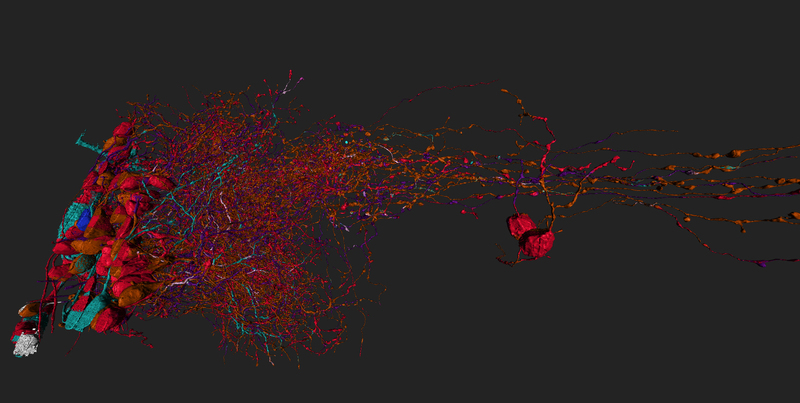 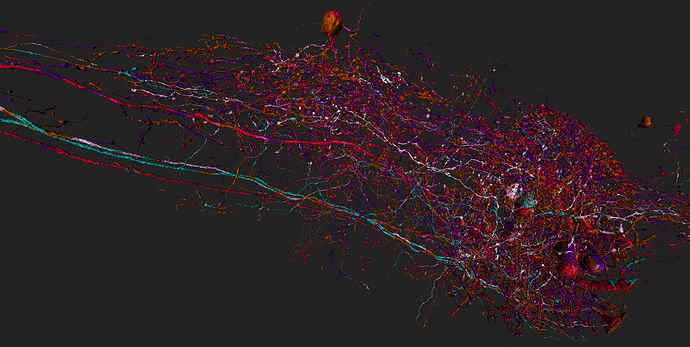 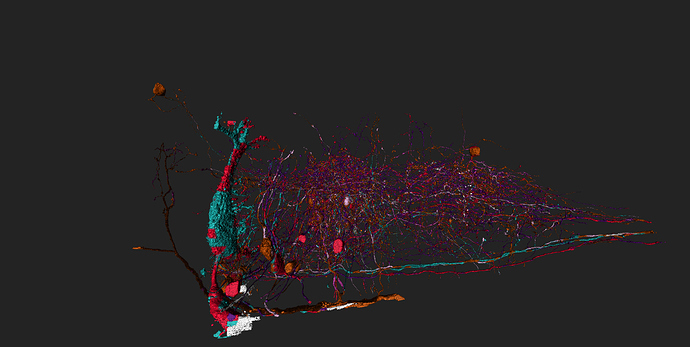 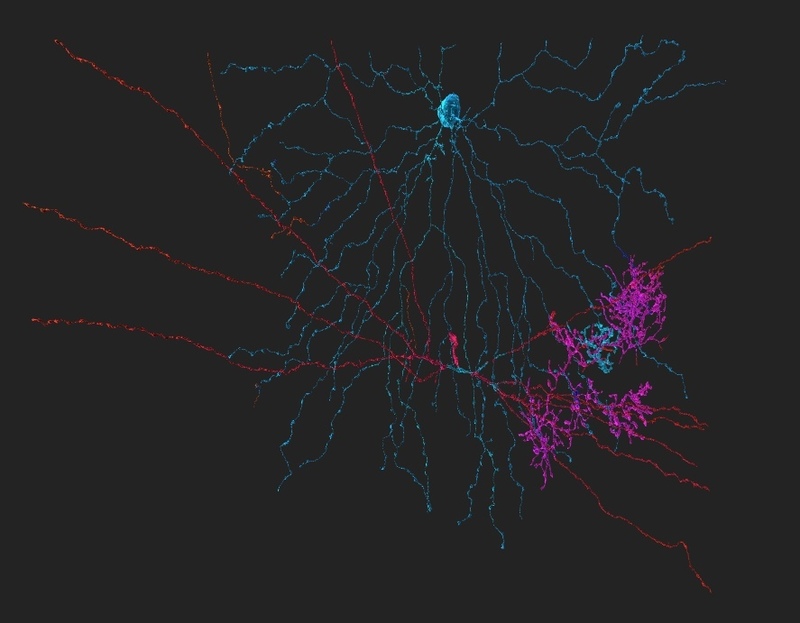 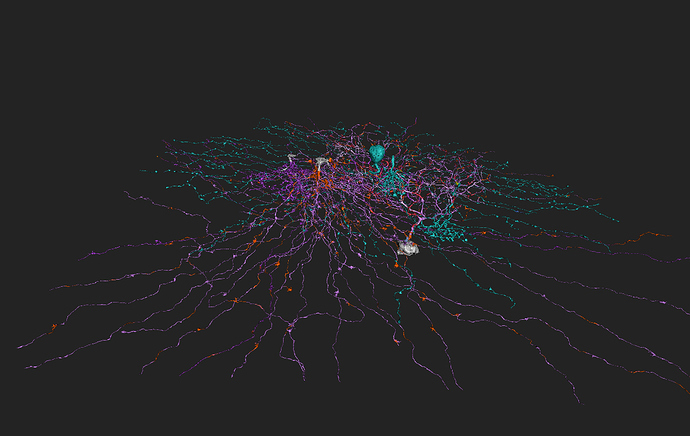 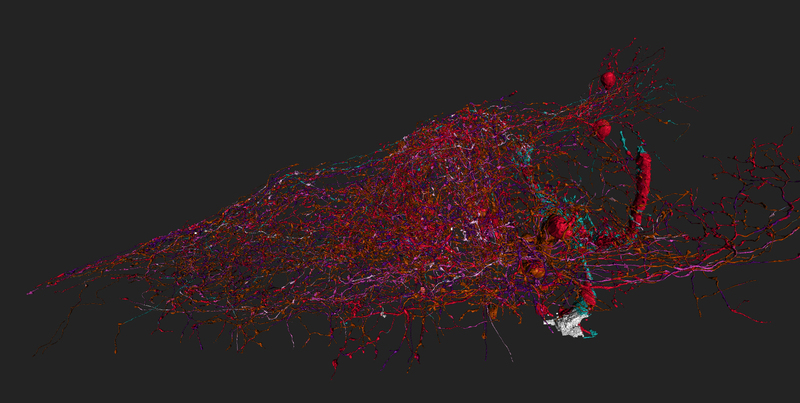 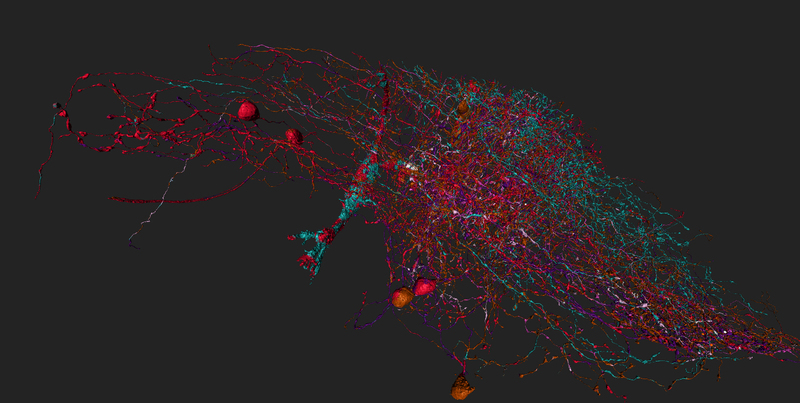 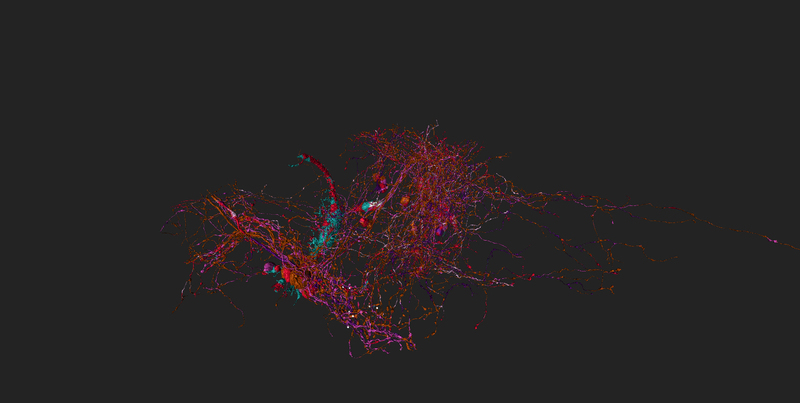 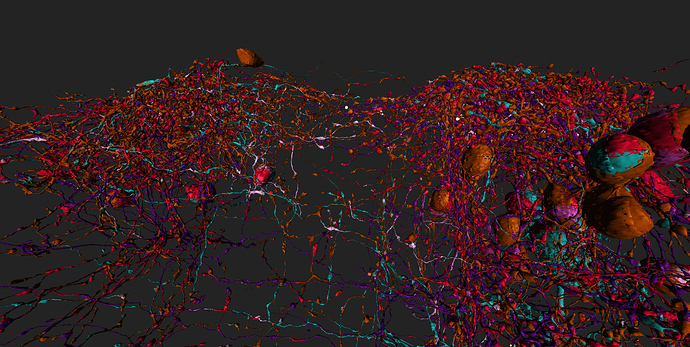 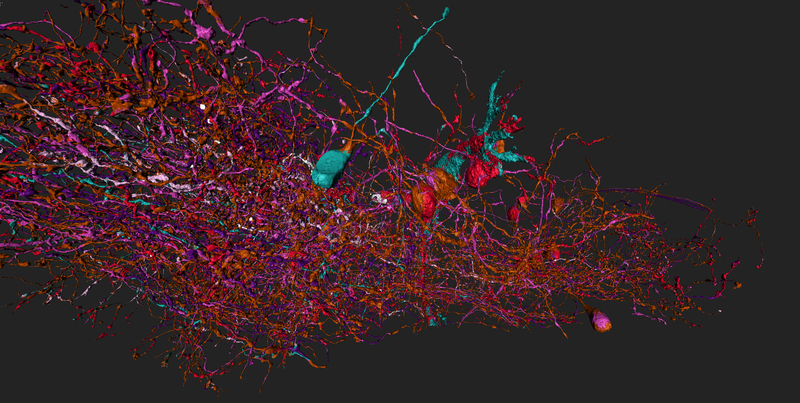 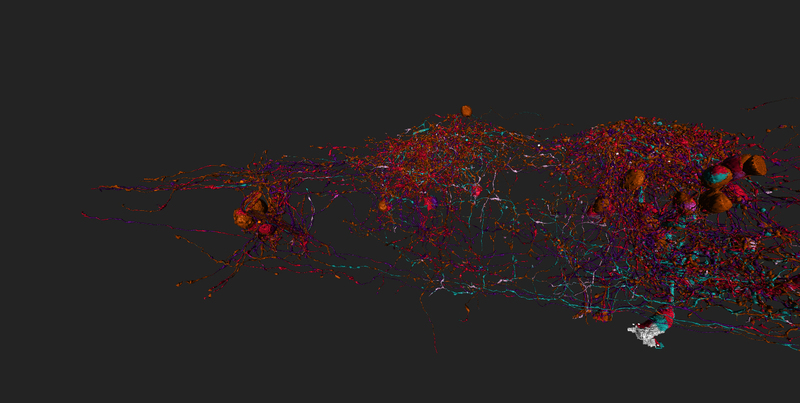 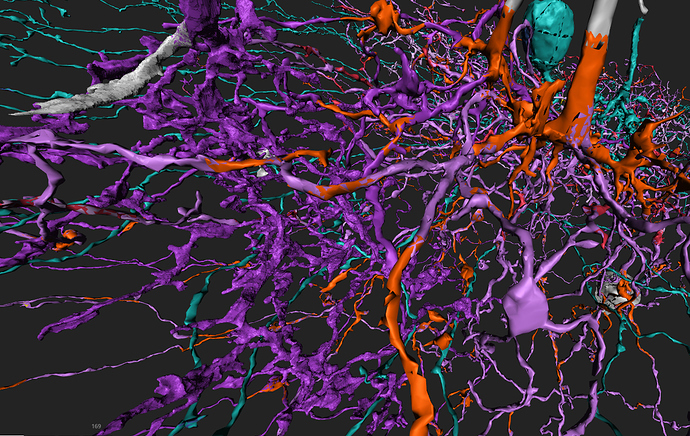 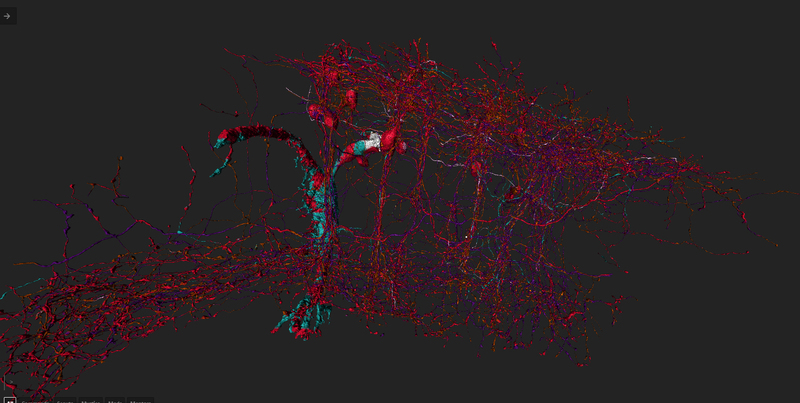 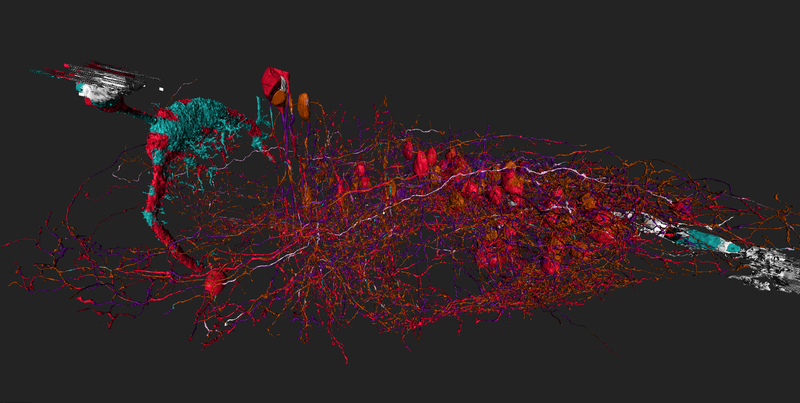 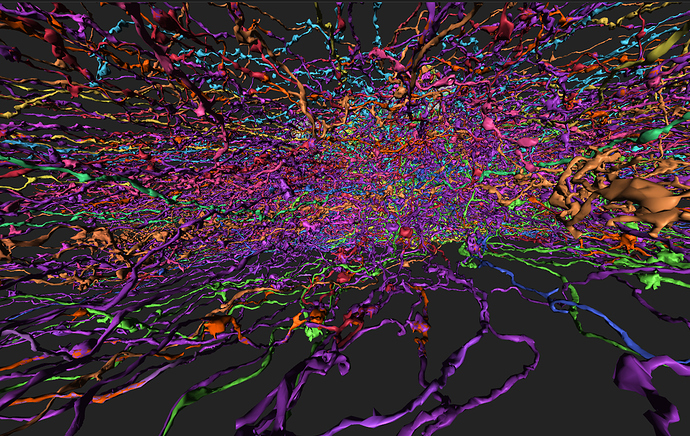 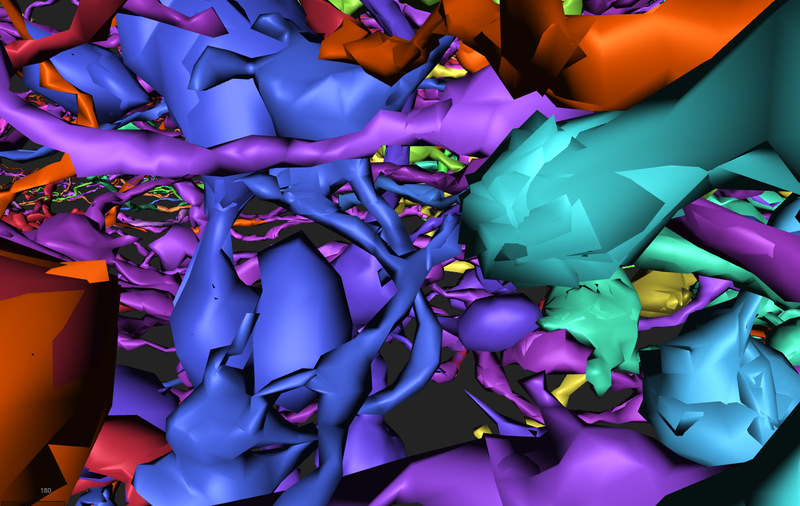 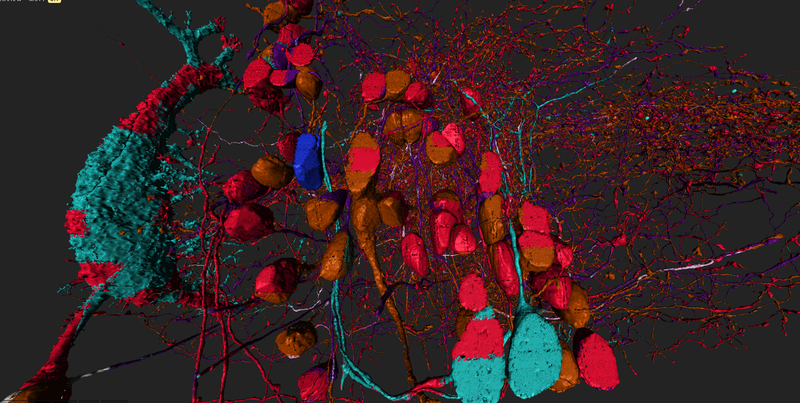 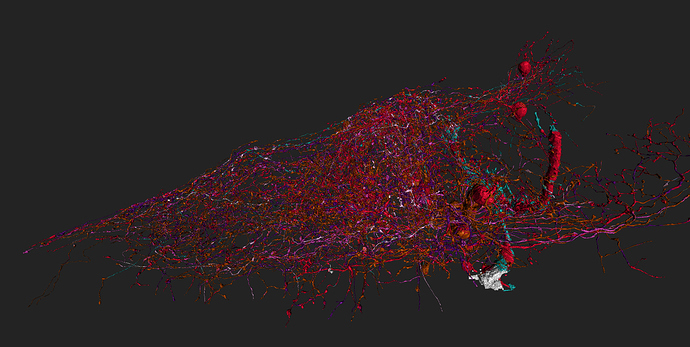 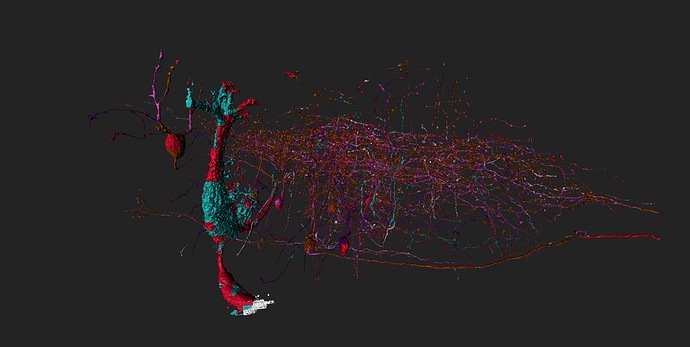 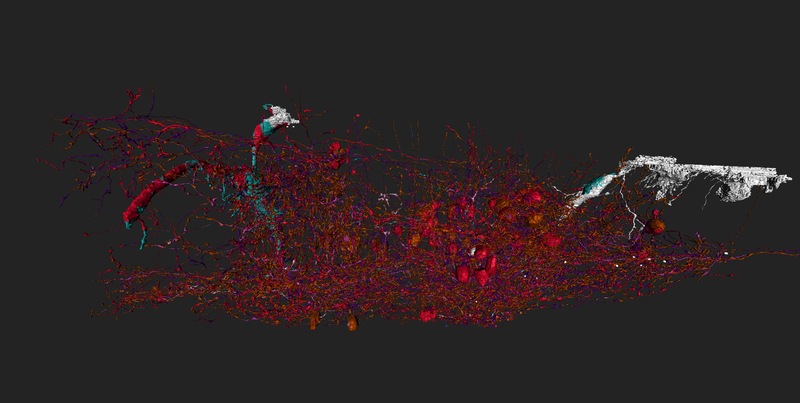 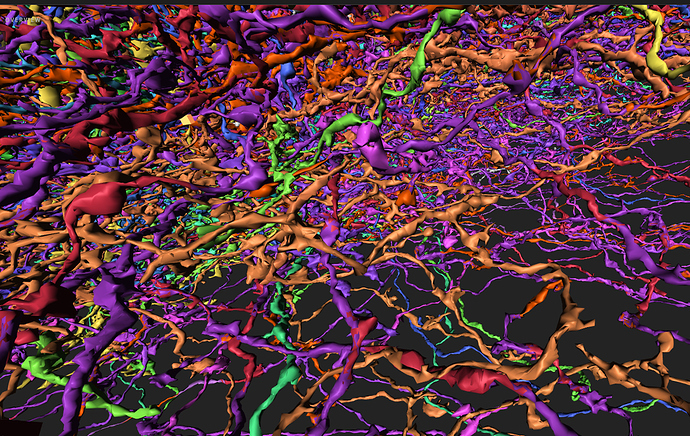 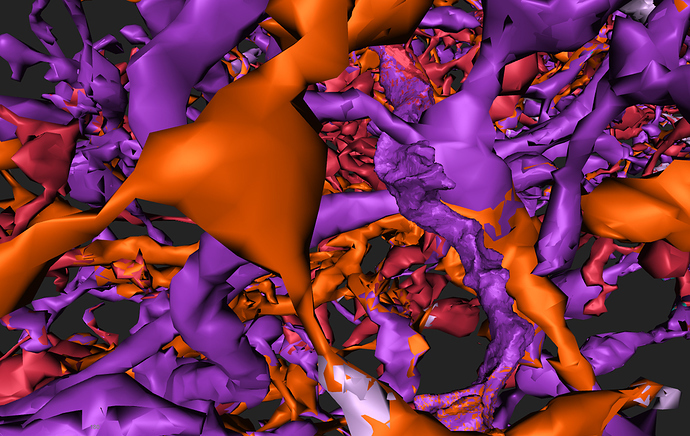 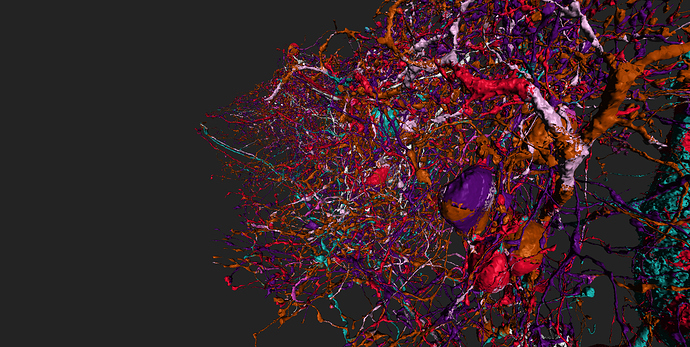 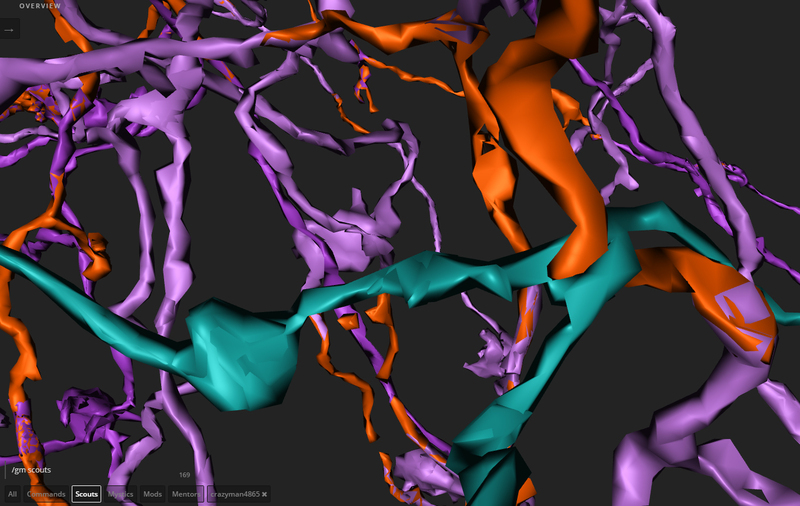 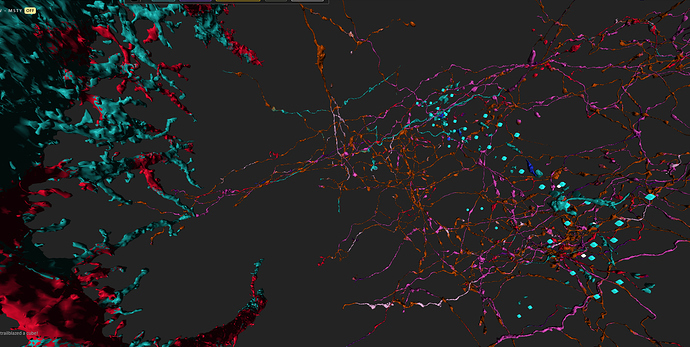 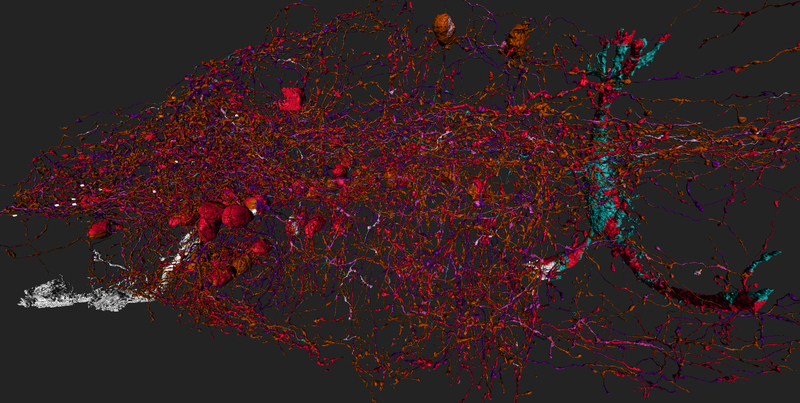 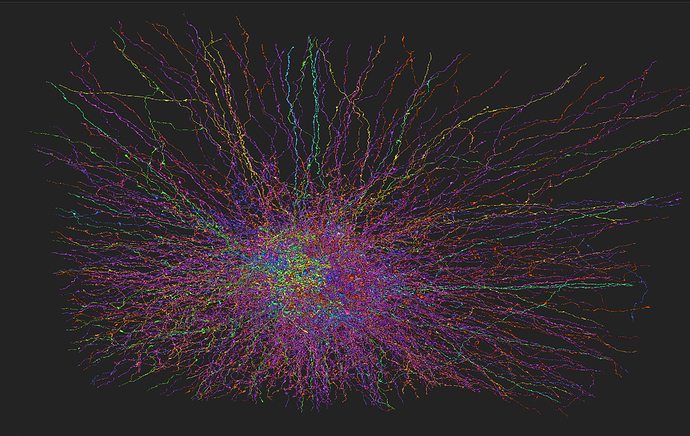 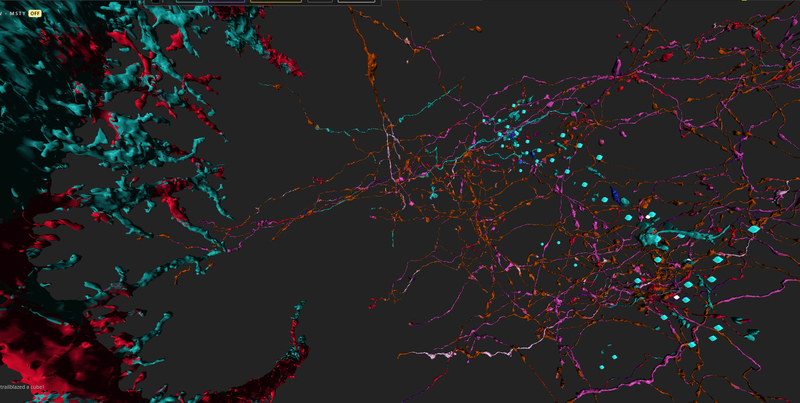 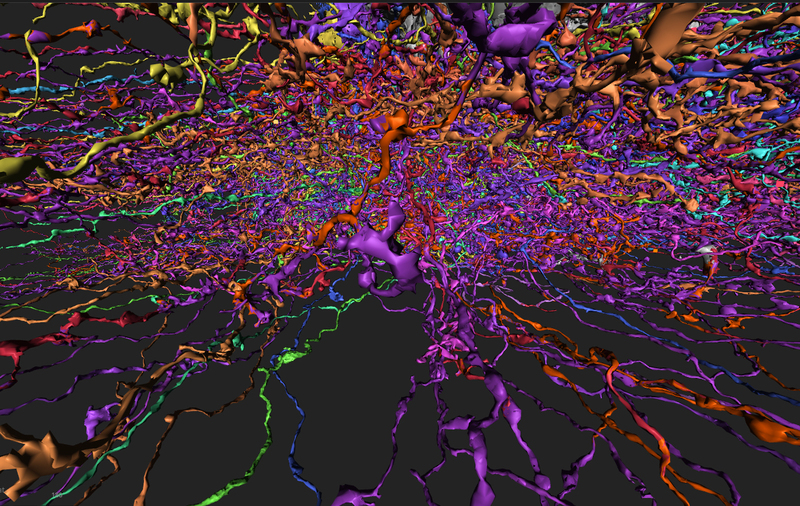 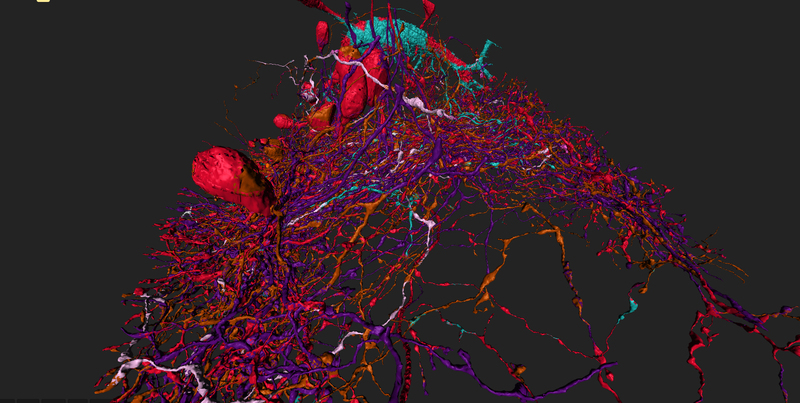 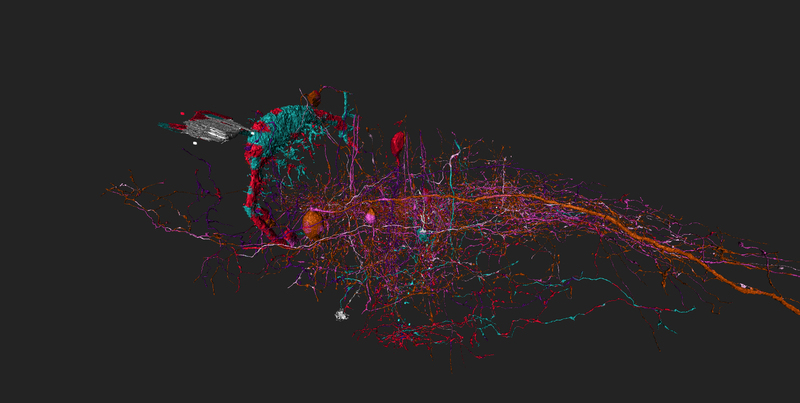 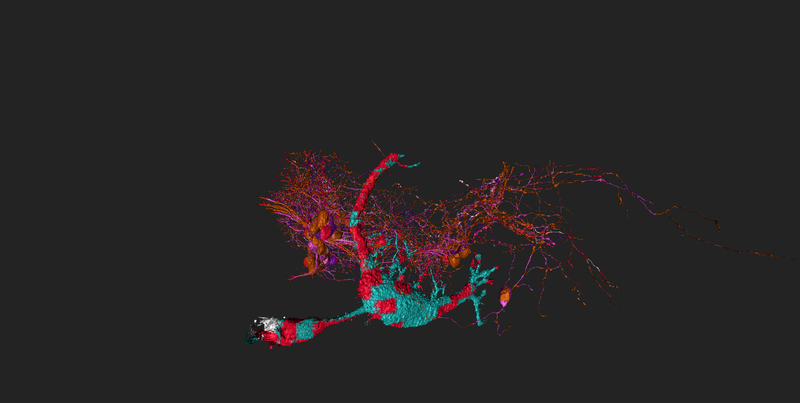 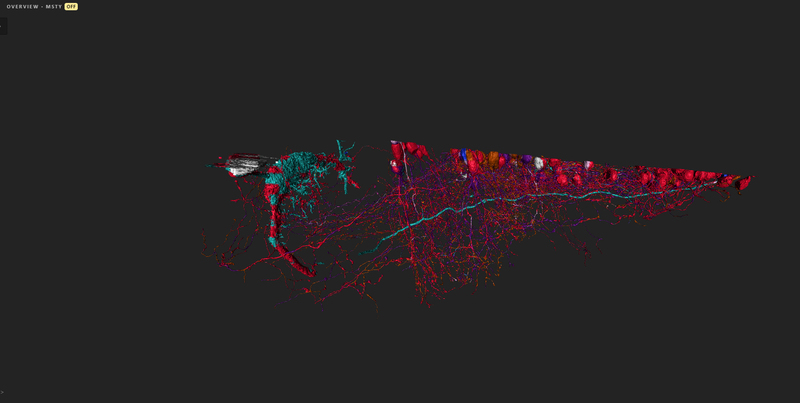 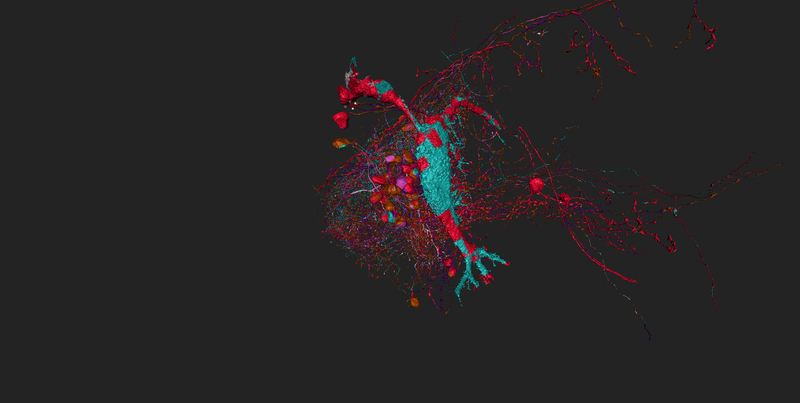 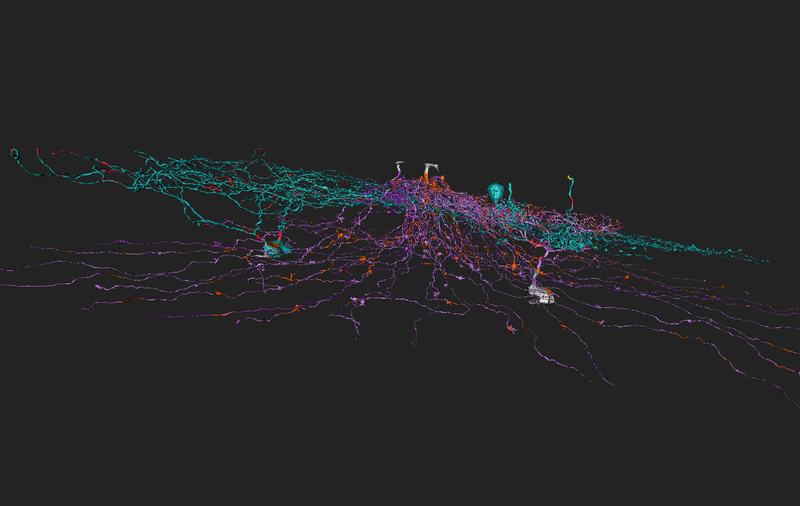 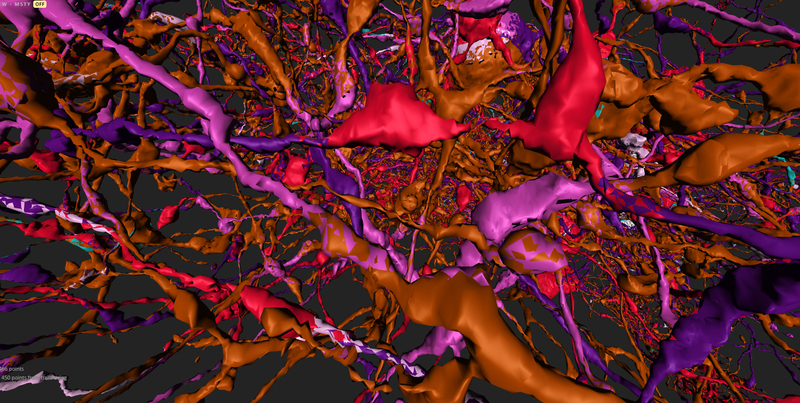 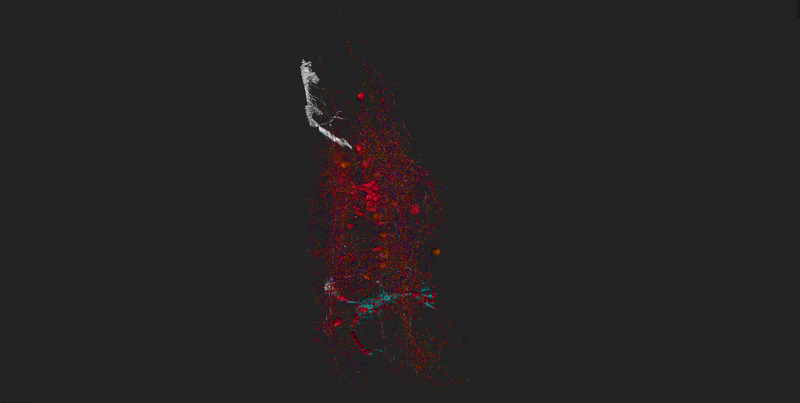 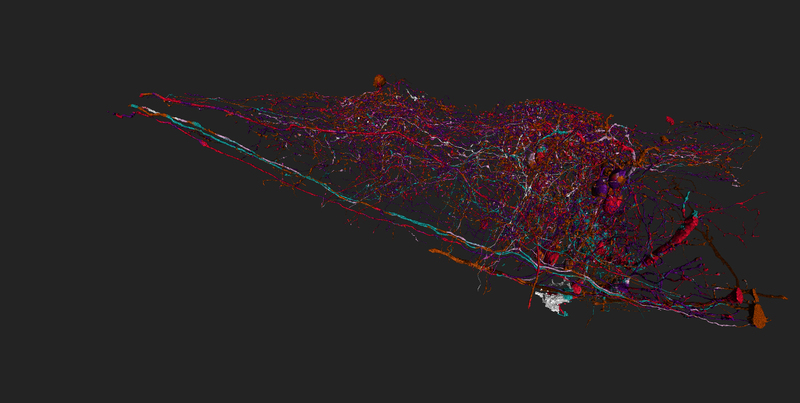 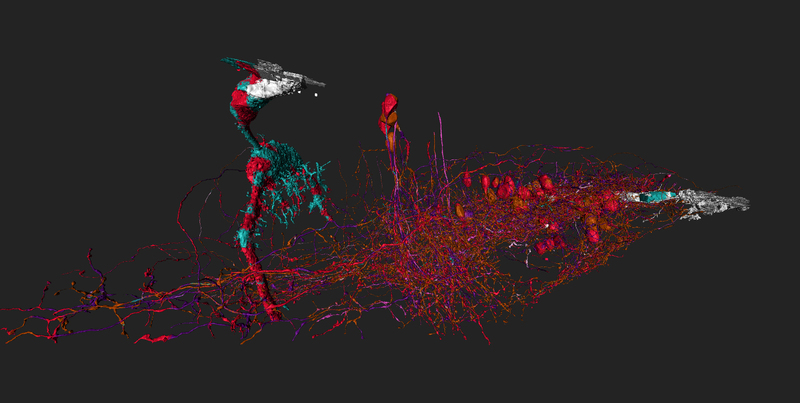 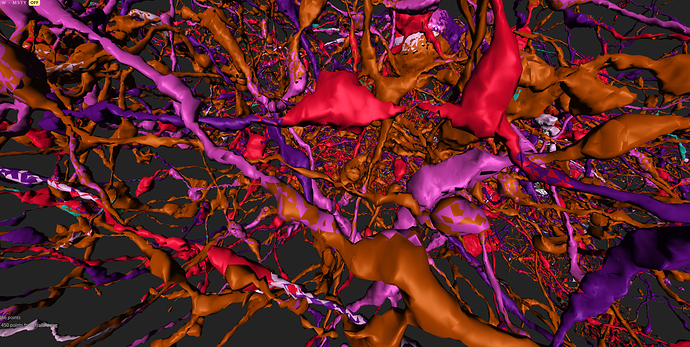 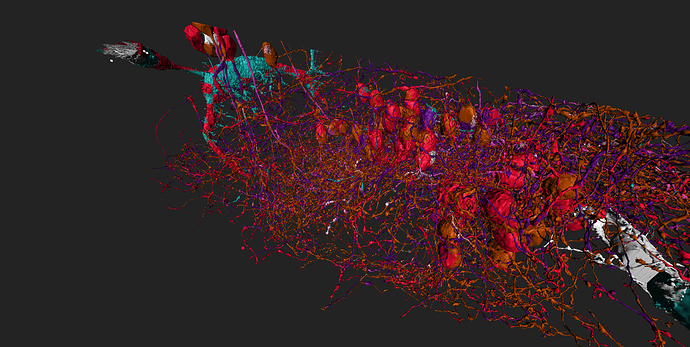 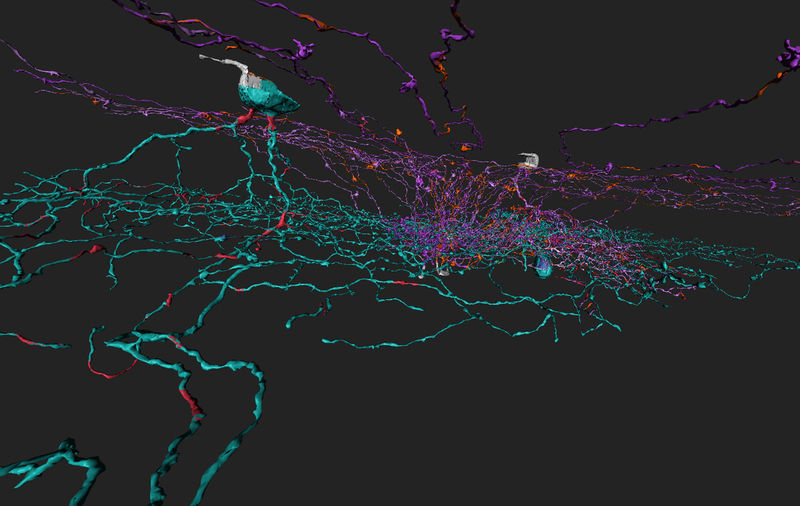 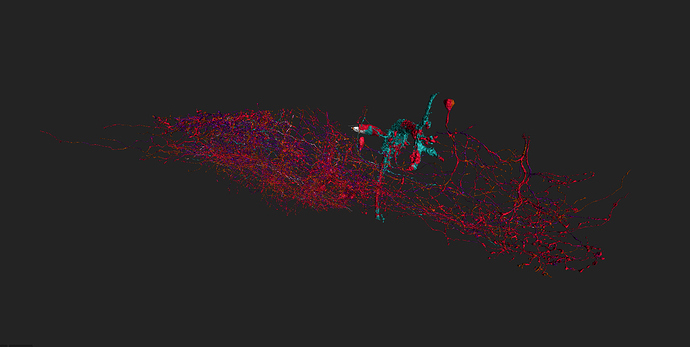 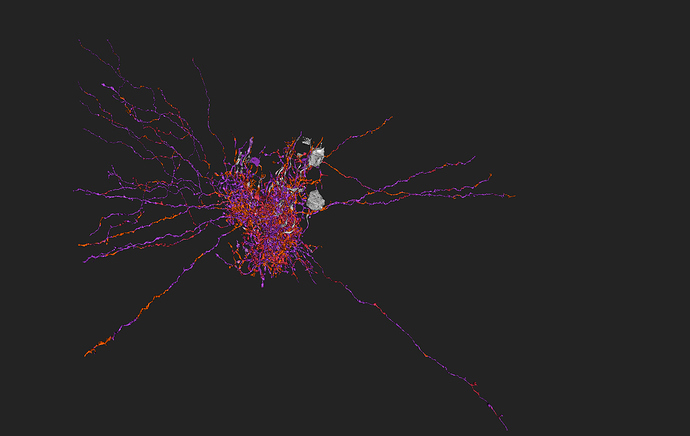 So, I’ve always wanted to see pictures/screenshots of neural networks as we complete cells. 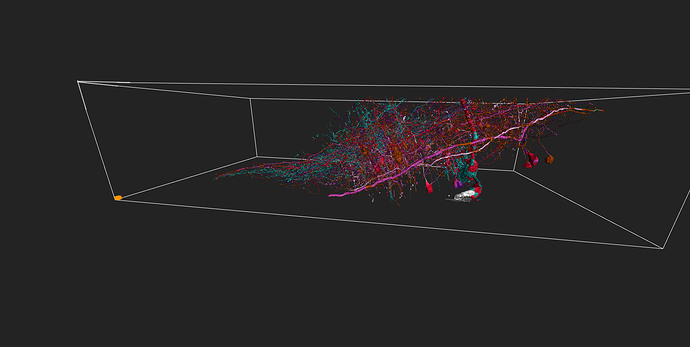 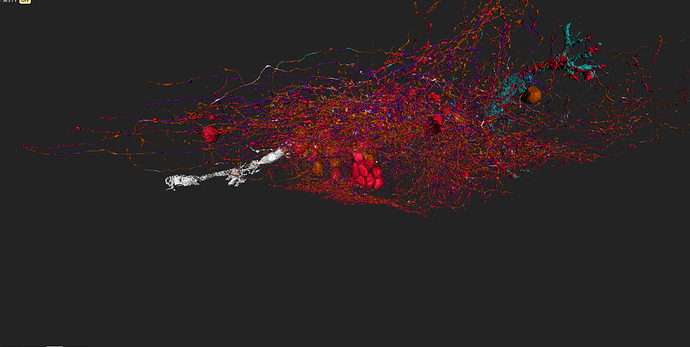 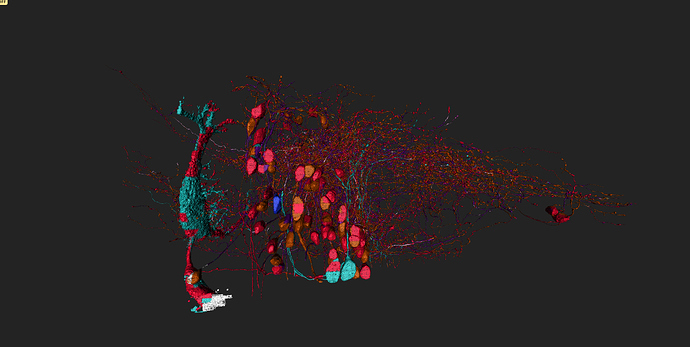 For example, after a/each sector is finished to have a pic of all the cells traced in there in one overview pic. 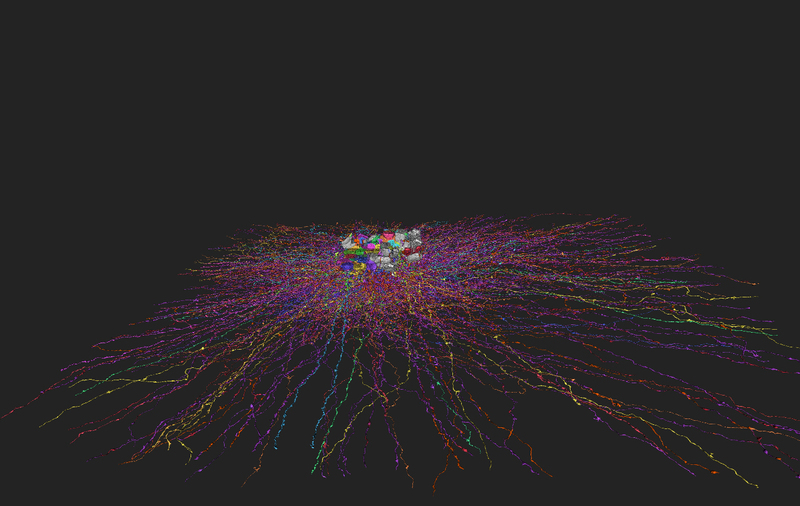 Unfortunately (and can’t blame them for it) admins don’t do it b/c it’s a lot of time/work lol. 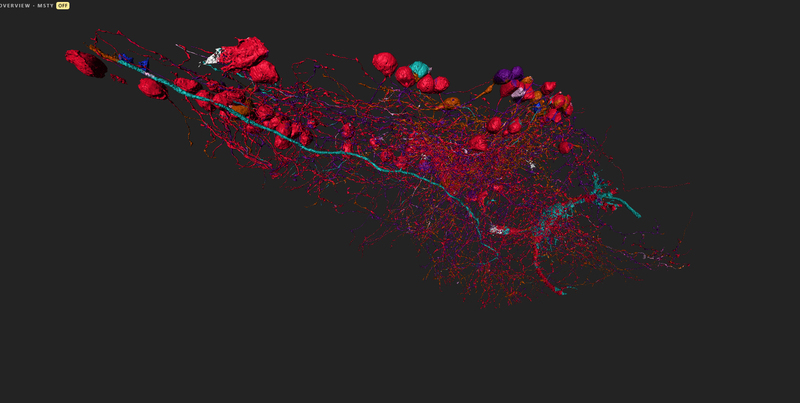 So with the command /add-cell Imma gonna try grab some such pictures, Much older cells like Ganglion (Mystery cells) and Starbursts (SAC) don’t have a meshed overview anymore but I’ll try and find some, and I’m hoping sectors 1-5 of Dig are still meshed. 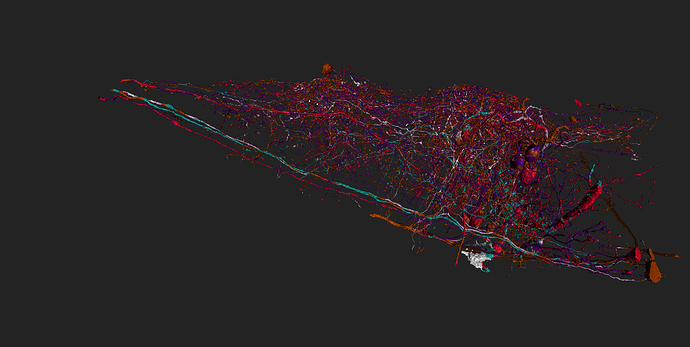 EDIT: sectors 1, 2 and 3 are not meshed, but 4 onwards seem to be. They should be (screenshots) HD enough for anyone who wants to use them as backgrounds. p.s. tthe more cells you add the heavier the ew tab will get, depending on your system it may “oh snap” at any amount of cells, if you see it getting heavier (more difficult to pan/zoom etc) /silence chat, it helps but eventually even with that the tab will go out of memory and crash. gorgeous pics - thanks for doing! 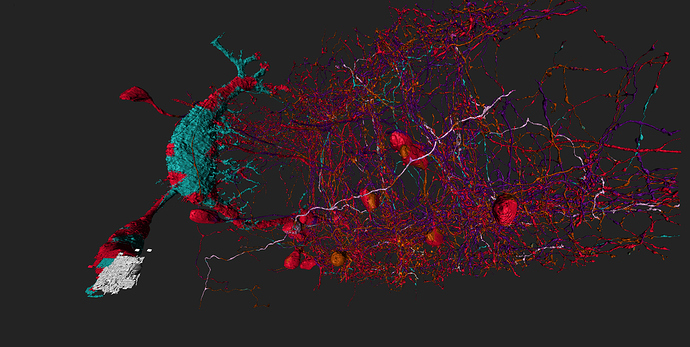 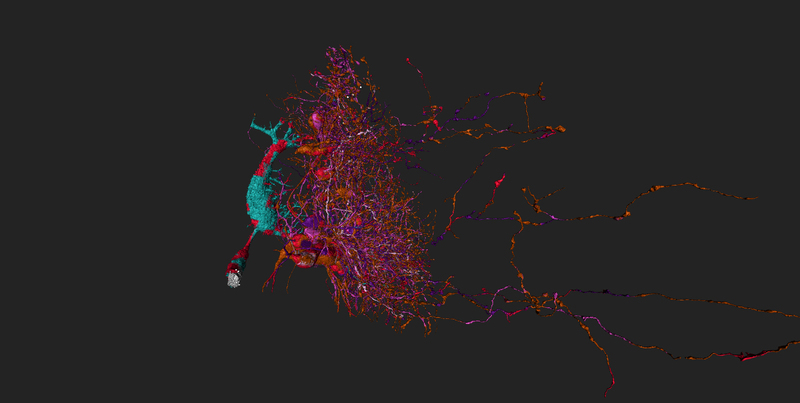 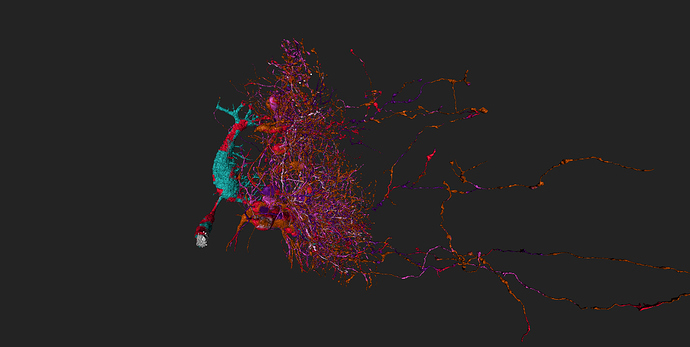 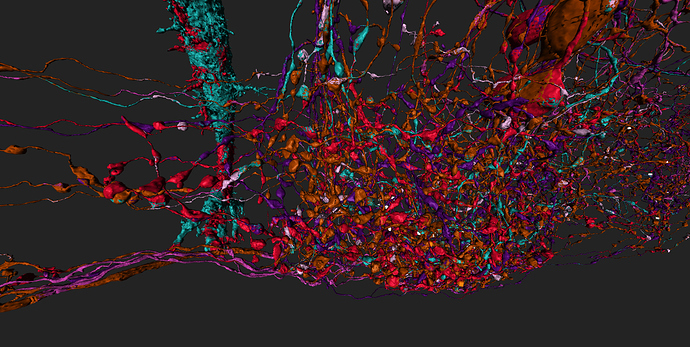 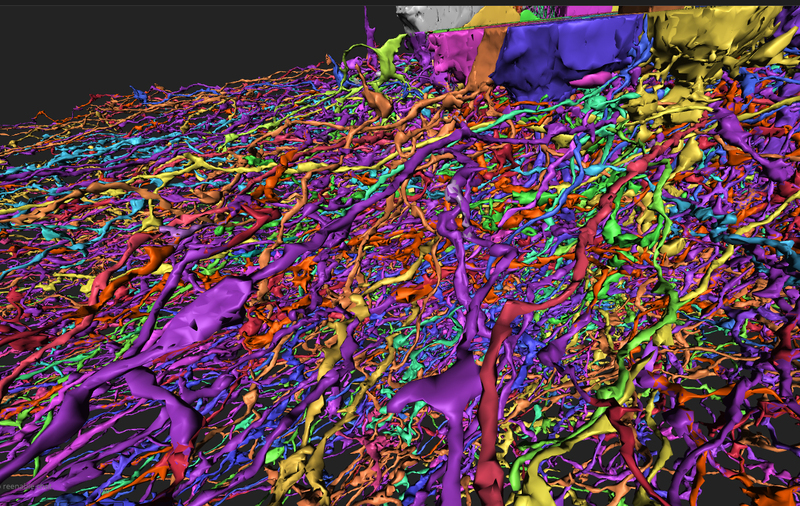 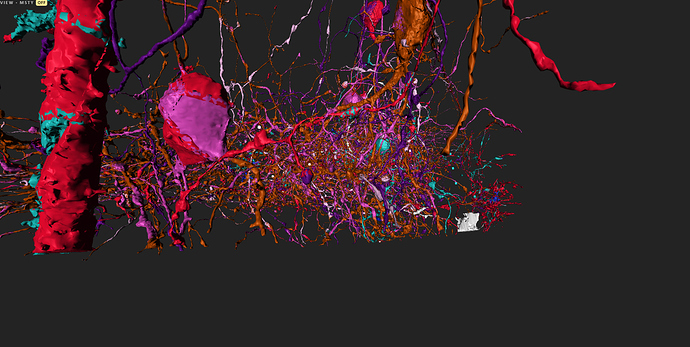 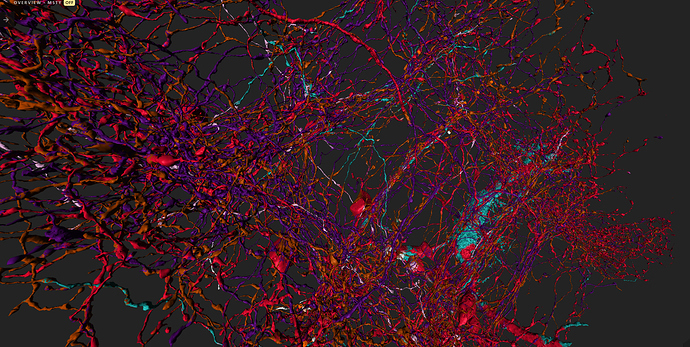 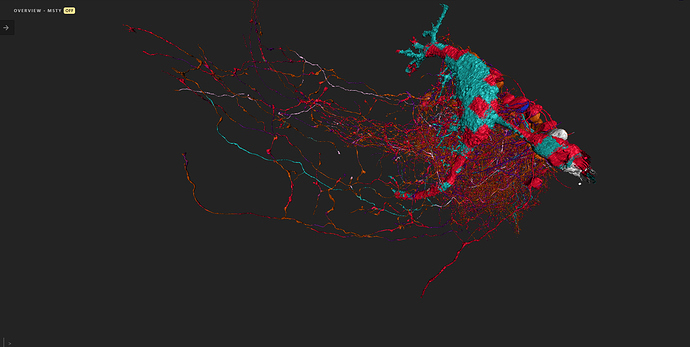 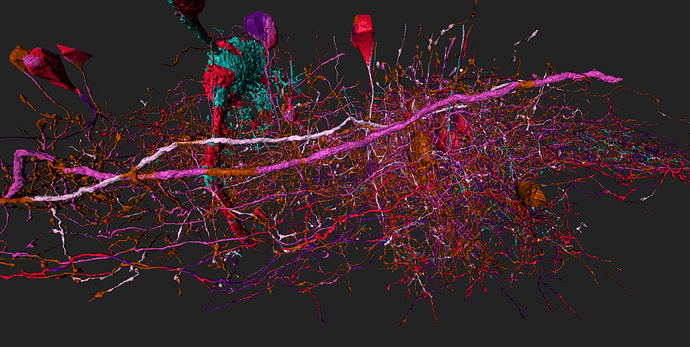 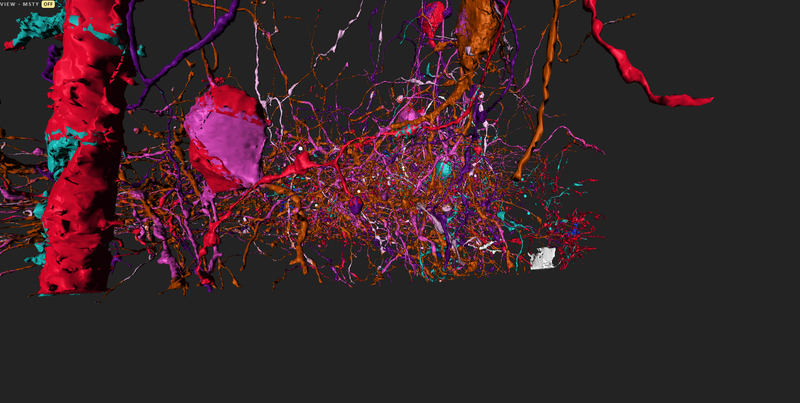 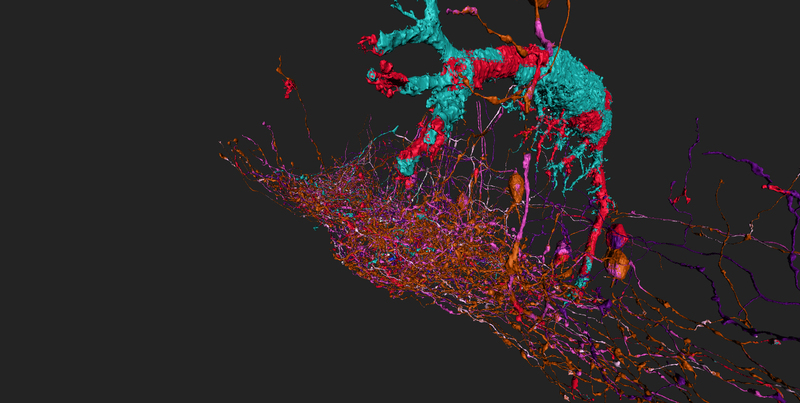 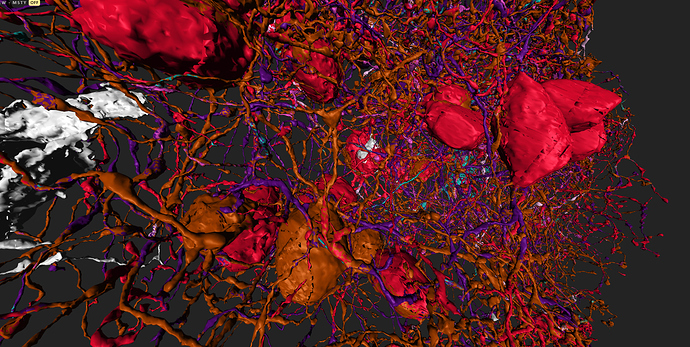 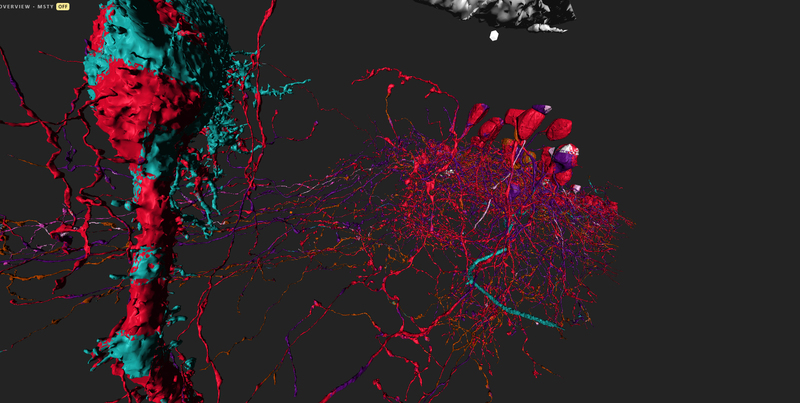 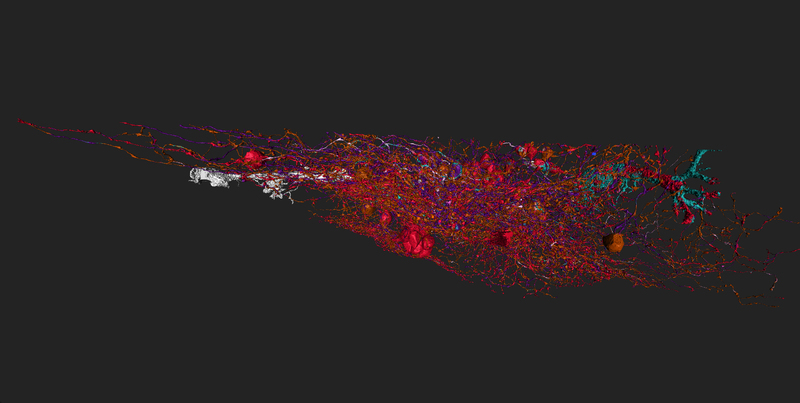 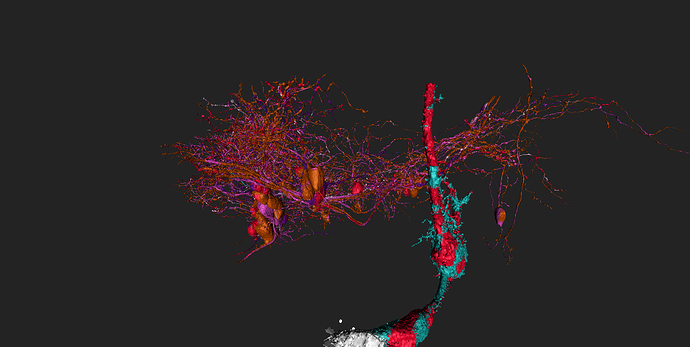 I’m interested in synapses, but looks like these bipolars just pass the starburst-plane and dendrite in other plane. 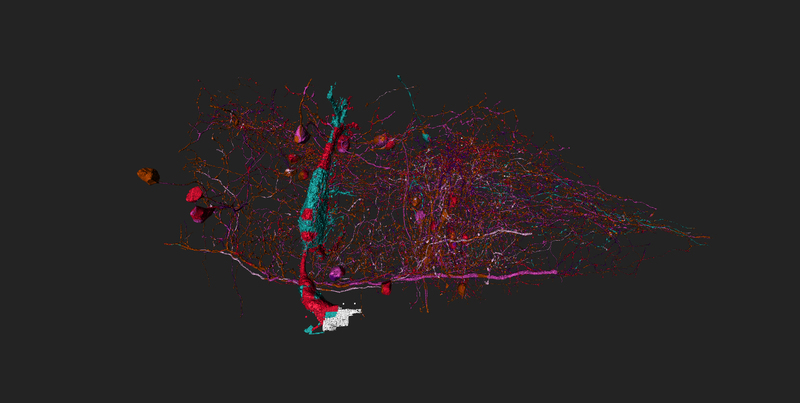 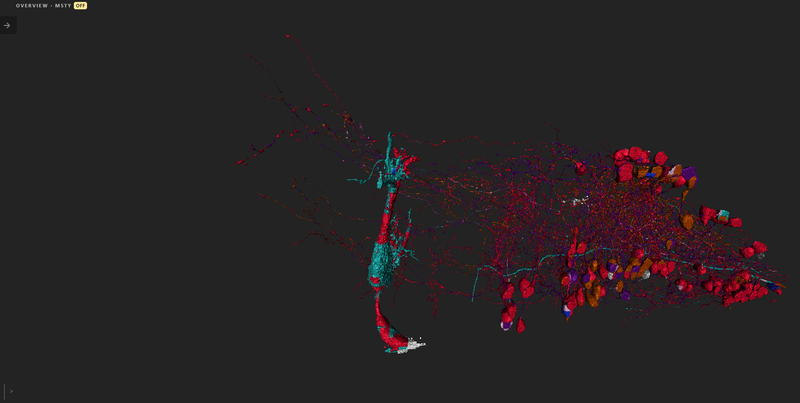 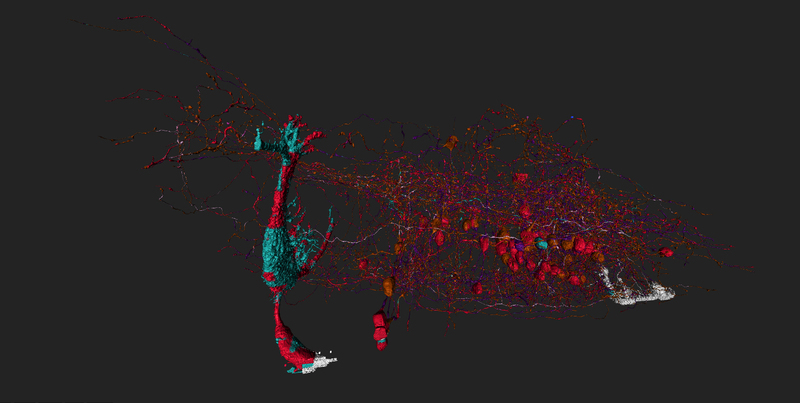 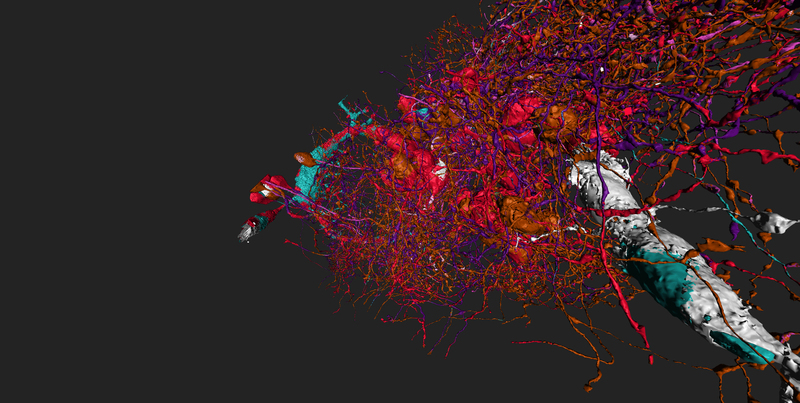 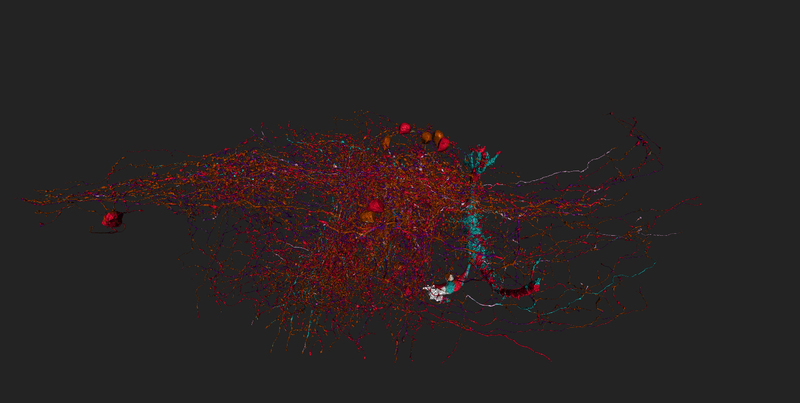 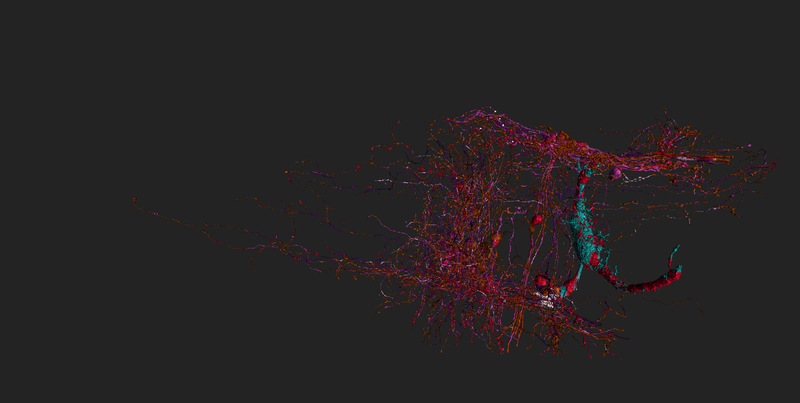 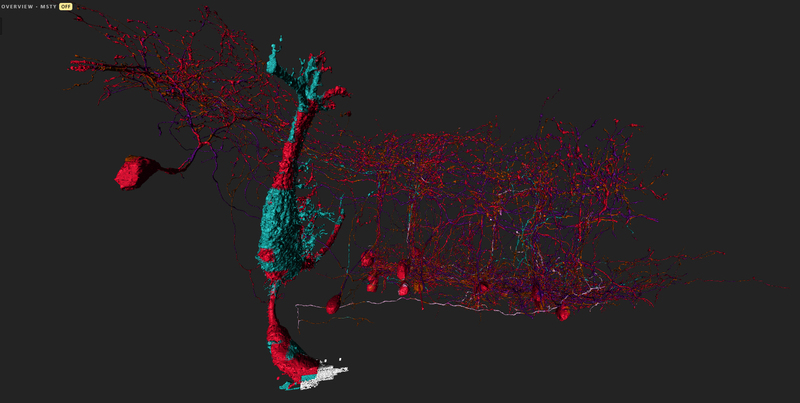 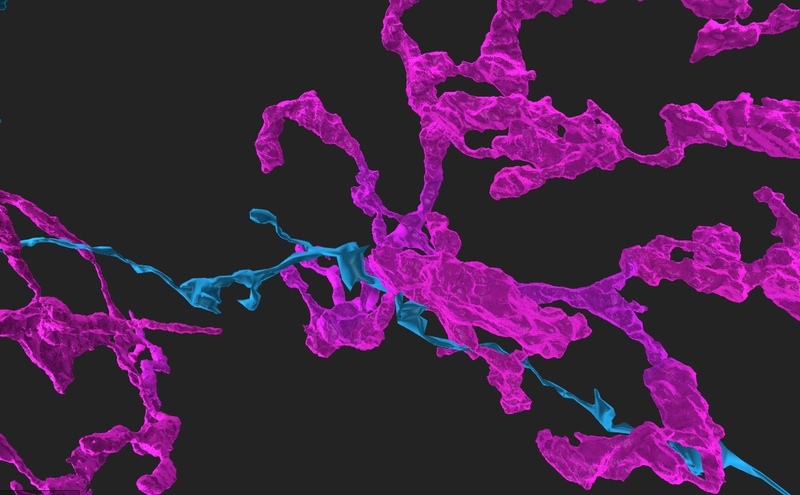 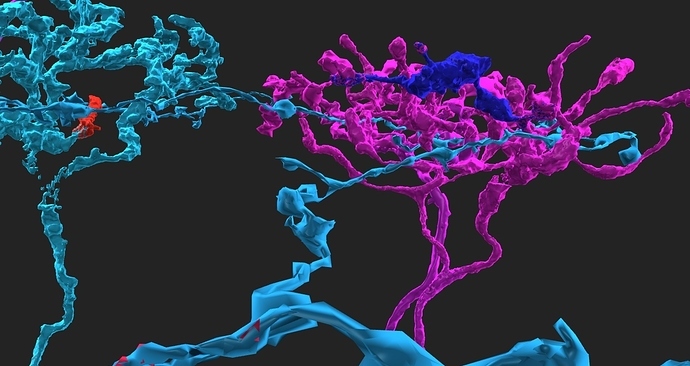 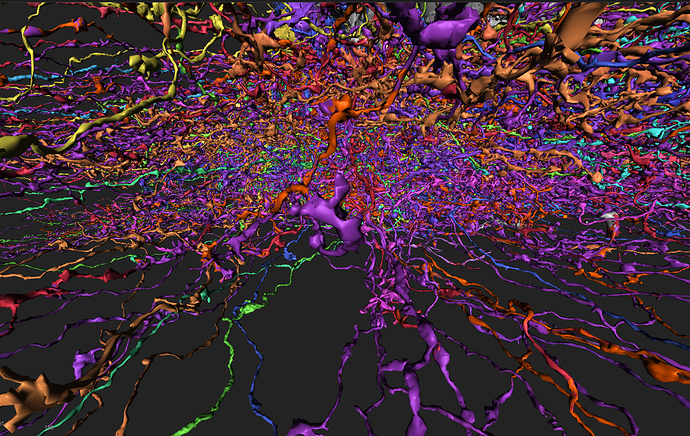 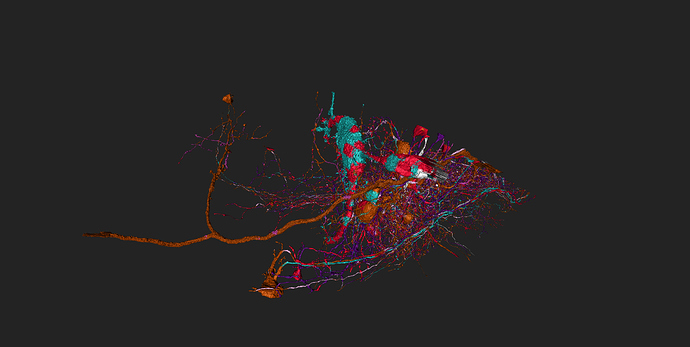 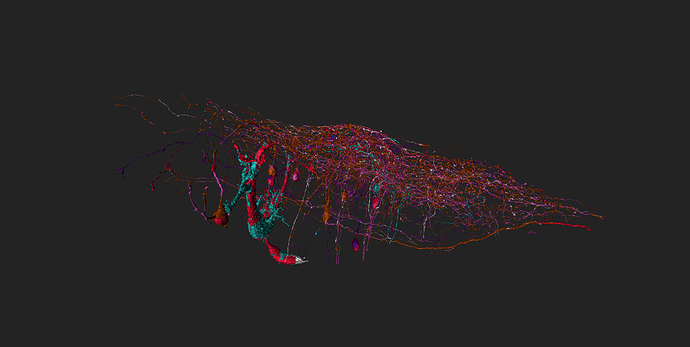 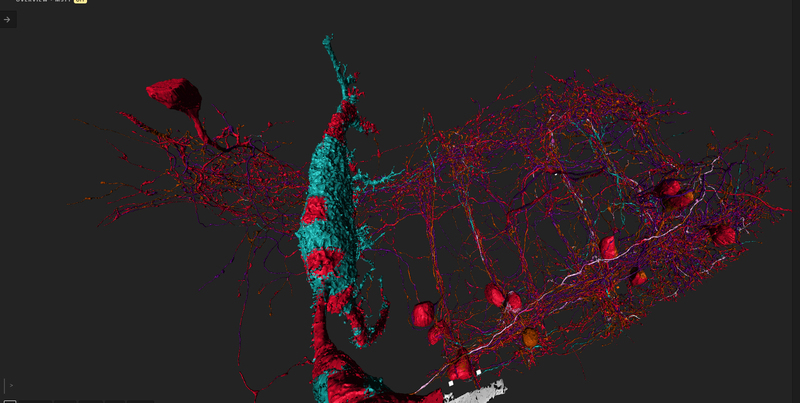 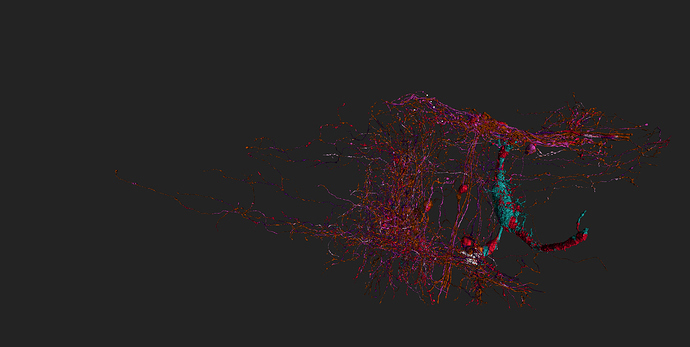 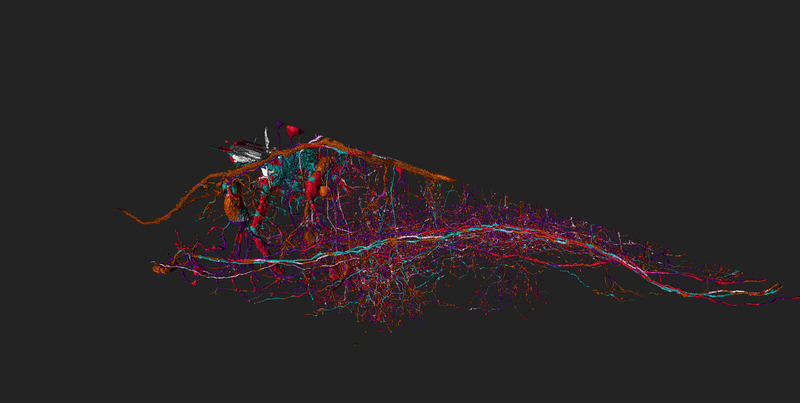 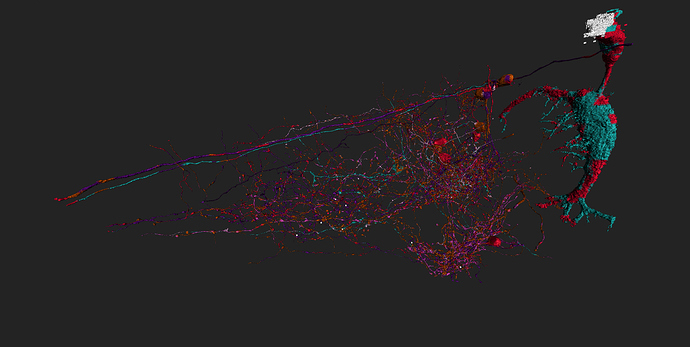 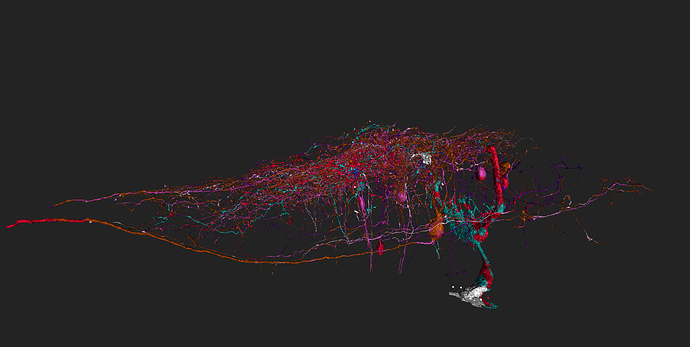 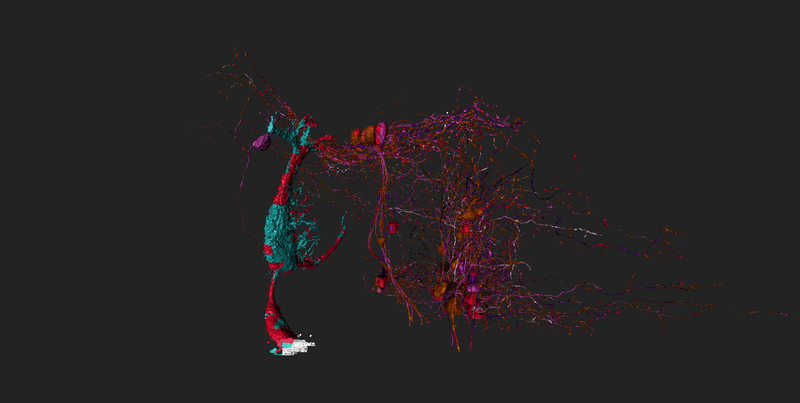 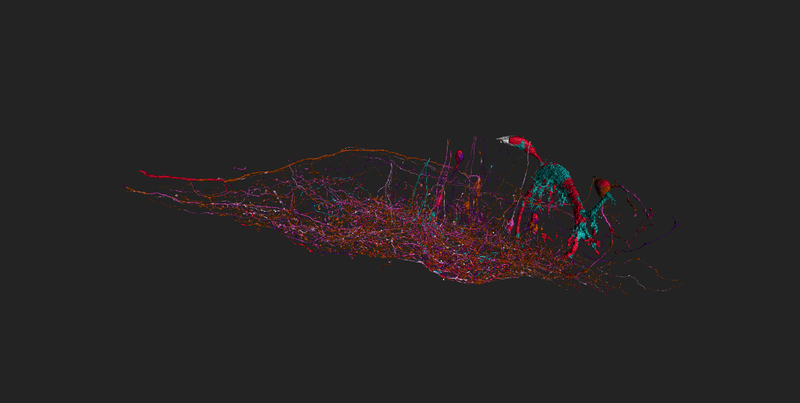 Perhaps some synapses in one of the bipolars ? just as there are bipolar cells ON and OFF also don’t know if BPs on/off synapse with SBs on/off or if it’s a free for all (SBs on/off synapsing with both BPs on/off lol). also, there may be other bps either traced by HQ or in other sectors or not yet traced which may synapse with this SB cell lol. 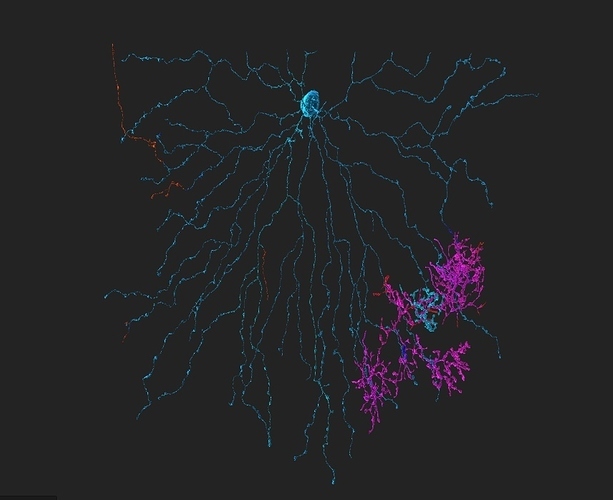 How did you guys made picture like that? /add-cell add as many cell ids as you want, but be warned the more you add the heavier overview will become until tab crashes. you can find cell ids in /debug. 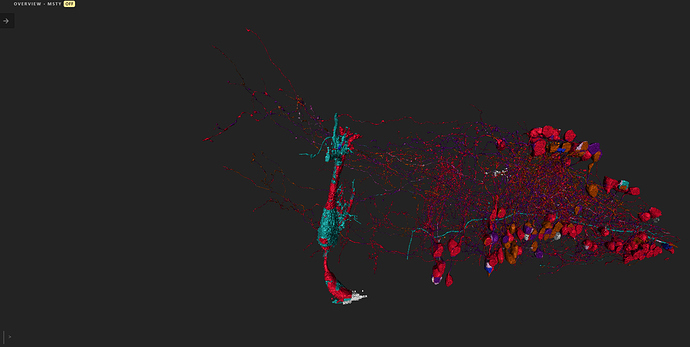 I arranged overview so that each cell in it “falls” in the corresponding area in dataset pic. That’s great. 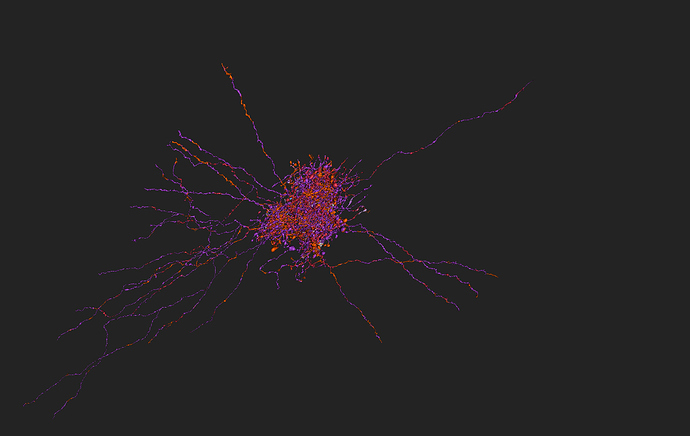 Shows, that cells aren’t that far from each other as one might think doing one cell at a time. 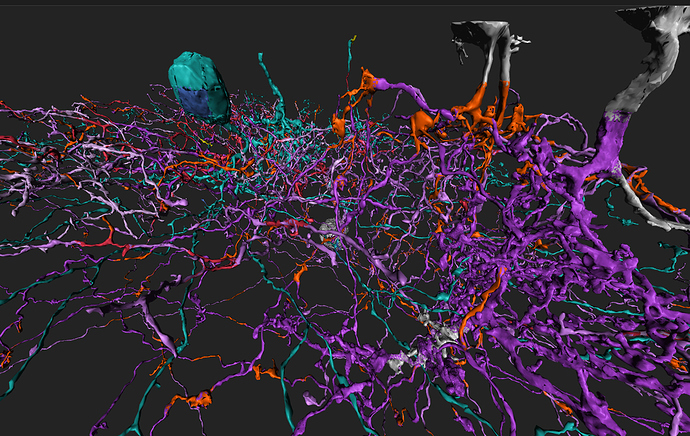 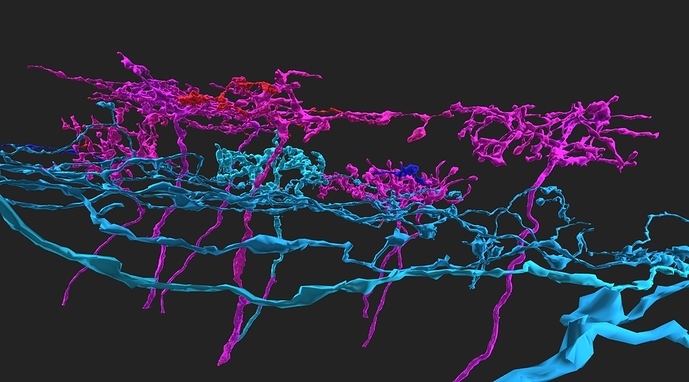 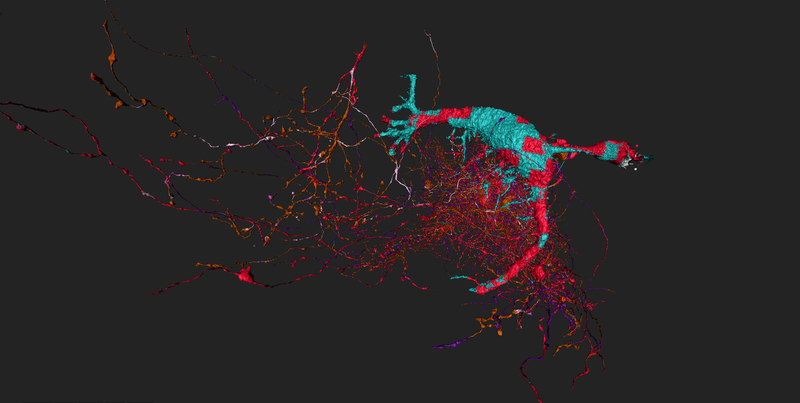 Also, when I have started playing, I thought, that each cell (soma, axon and dendrites) ends inside its sector, while this picture clearly shows, that it’s not true (especially 10.1, lol). 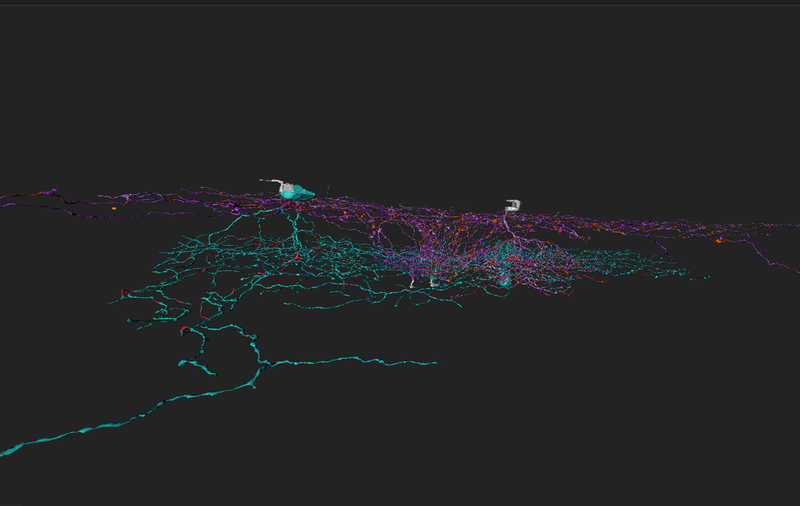 I think the only cells that start and end within their own sectors are vertical cells like bps and the other type that goes vertical with cb and huge boutons that admins sometimes ask us to reap cb nubs on before release lol.